It’s a fact: life in Singapore can get hectic and busy. With work and family taking up so much of our time, it’s often hard to find time for ourselves. And at the end of the day, how much time do we actually have left to ourselves? 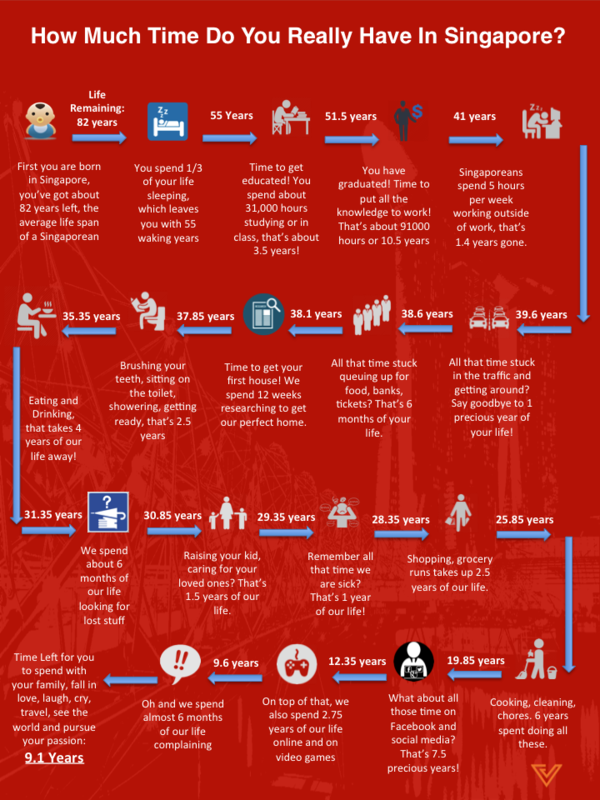 We’ve created a handy infographic to chart out exactly how Singaporeans spend their time and came to a shocking conclusion — we have just 9.1 years left to spend with family, fall in love, laugh, cry, see the world, and pursue your passions. So how do we change this? Well, there are things that we can’t avoid like sleeping and eating, but there are certainly things that we can do to make our lives more productive. Here’s our take on the top Do’s and Don’t’s for saving time, so you spend less time doing, and more time actually living. Go on, go get a life! Instead of queuing for stuff, you should find one of the many ways available to beat the queue. Some restaurants are well-equipped with POS systems that will send you a message when your seat is ready, so you can spend more time with your loved ones instead of spending them in a queue. Menial queues can also be cut out completely — banks like DBS have an SMS queue system where you can schedule a time slot with your favourite bank branch instead of waiting in line. That’s guaranteed efficiency for you, right from the comfort of your own couch! Looking for lost stuff is always painfully time-consuming, so in this case prevention is better than cure. Stay organised — though it may take a few extra minutes at first, having the habit of keeping everything in its place is a great time-saver in the long run. And if all else fails, use tools like Linquet, a smart keychain that helps you locate valuables like your keys or wallet. It sometimes takes ages to do research for the best deals, and Singaporeans are well known for being kiasu enough to research a topic to death before committing to a purchase. But it actually doesn’t have to be this tedious; sometimes it’s just about finding the right tools to do research in a smarter way. If you love shopping and dining, the DBS Lifestyle app tells you what’s trending and gives you the best deals at your fingertips. Now you’re empowered with knowledge of the best deals the moment you enter a shopping mall! When you can’t beat it, find a better way to do it. If you’re eating, do it eat healthily so you can decrease that 1 year you spend getting sick. If you’re going to spend time commuting, use it as an opportunity to meet new people! Homegrown companies like RYDE specialise in ride sharing, so that you can get to your destination quick, whilst getting to know someone with a common interest. You can even pay for your ride with DBS Paylah, saving you more time from that additional trek to the ATM for cash. 10.5 years is a long time to be working, so make sure that you find a job that’s actually something that you want to be doing. A great investment of time to an important goal or your general happiness can unlock potential to do many things. Time is ticking, folks. When you’re time poor and the chores are in your face, consider getting someone else to do it for you. Running errands, doing the groceries, or cleaning the house rob you of precious time and can be draining. Services like HonestBee or RedMart are great in this respect and deliver your weekly supply of food to your home in just a few clicks. And instead of cleaning the house, try services like The Sunday Crew or Helpling to keep your space spick and span! After all, a clean home or work environment goes miles in boosting productivity. Not everyone can enjoy the luxury of having a personal assistant at their beck and call. For the right price, services like Djenee can act as a virtual personal assistant, sending people to run your errands, get your lunch, and pick up your dry-cleaning with a single message. If you’re just looking for real estate help, homebuyers get a virtual personal assistant too in the DBS HomeConnect app. The app helps take the guesswork and worry out of the home buying process, and gives you essential information at your fingertips. Simply take pictures of the homes you are considering, and the app will pull out useful information such as past transacted prices and monthly repayments instantly. This means you can cut down on time spent on research, and prevent any potential heartache! If eating is a uniquely Singaporean pastime, then it can be argued that some sort of complaining comes in at a close second. Every minute is precious, so don’t spend too much time just whining when you could be better off making the best out of your situation. Stay positive, and save that extra 0.45 years to actually do something that matters to you. And there you have it,top tips to make your time count! Imagine how you could pursue your dreams and the cool things you could do with this new-found time. Share this with your friends and get them started on getting a life!